Learn how to beat Topper in Super Mario Odyssey. This guide provides a few strategies that you can use to defeat him during the second battle. Topper is one of the Broodals, the secondary antagonists in Super Mario Odyssey. The Broodals are a group of rabbits who serve as wedding planners for Bowser and Princess Peach’s wedding. He is fought at the arena in Bowser’s Kingdom during the second battle. Like before, Super Mario Odyssey Topper remains clothed in a green suit with a yellow ribbon. He is also wearing a top hat with spikes around the middle part of the hat. 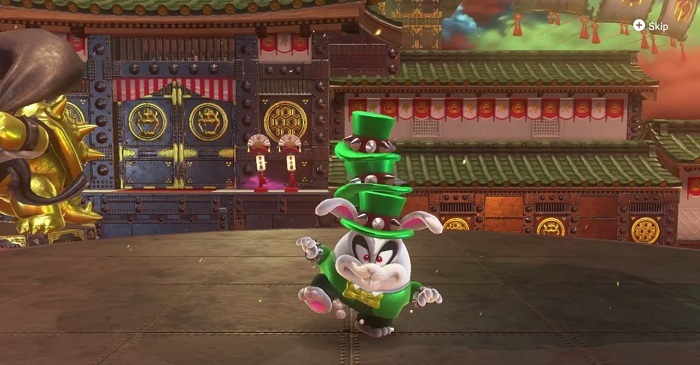 Topper deploys stacks of hats similar to the fight in Cap Kingdom so it is advantageous to simply stick nearby and attack him in order to stomp his head immediately. When you knock him out temporarily, he resumes by calling the wave of hats to cover himself. Topple them quickly, then aim for the one that stays active. Try to pin the lone hat to a corner and throw Cappy multiple times in quick succession to remove his stack of hats. Stomp on his exposed head to deal damage. Topper continues by forming another barrier of hats that will scatter across different directions. Take them out again one by one until the real hat remains. In case you find yourself in an unfavorable spot, leap and toss Cappy to dodge them. For the second phase, when the boss gets pinned, he rotates his hat to form a barrier of pink energy. Jump to escape the radius of his attack and wait until he tires out. 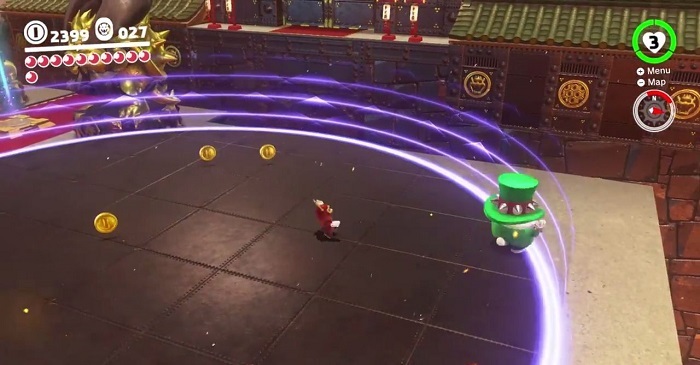 Continue to remove his stack of hats with multiple Cappy throws until he becomes vulnerable. Perform a ground pound on his head to finish him off.